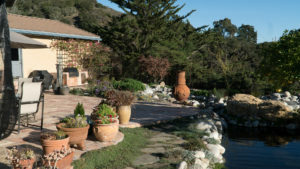 MONTEREY SPECIAL: $5,000 for the Month of May 2018! 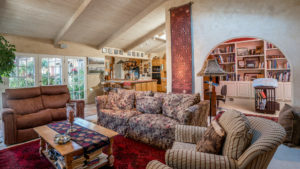 4 Bed 3 Bath Sleeps 10! 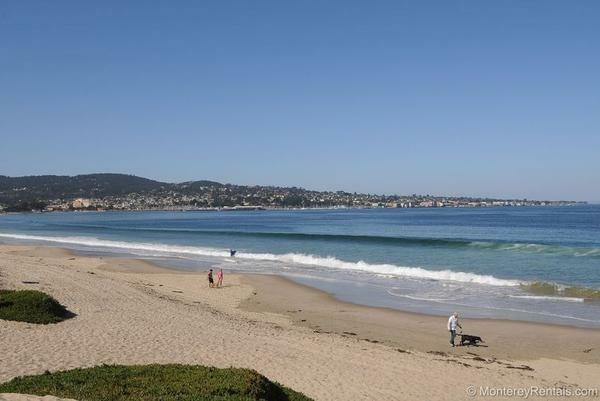 Enjoy incredible views from this sparkling contemporary on the beach in Monterey! Sweeping vistas of the Bay include Cannery Row and Fisherman’s Wharf, plus a modern kitchen and dining area, a deck and a backyard patio with a barbecue. 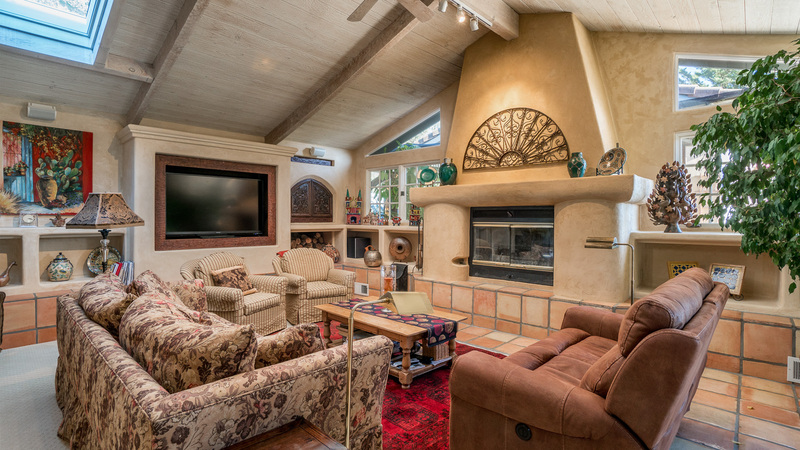 This home features a fully-equipped entertainment area—3 TVs, 3 DVD players, a CD player and an iPod dock. 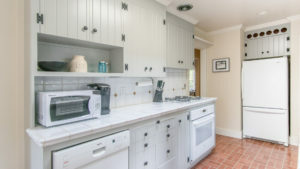 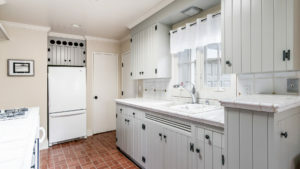 The fully-equipped kitchen includes a Nespresso machine (and complimentary capsules). 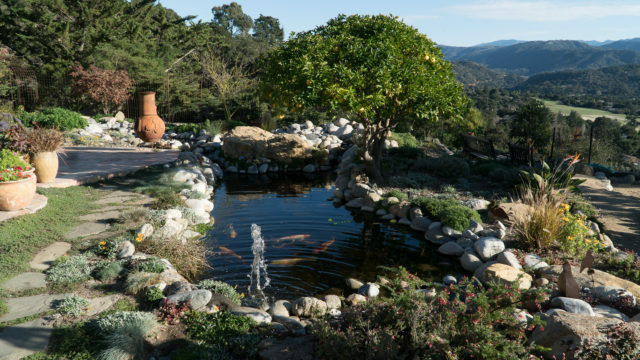 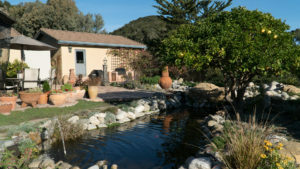 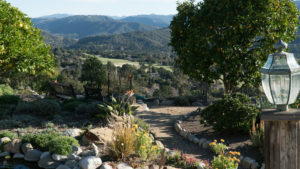 Enter through ornate, arched wooden doors and pass through a fern-lined corridor to a sunny patio with a Koi pond and bubbling fountain, fruit trees, flowers, and majestic views of Carmel Valley. 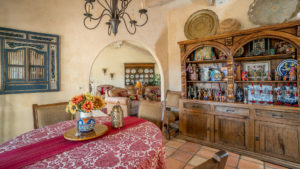 This comfortable, single story Spanish style “hacienda” features Saltillo floors, plaster walls, and Mexican tile counters. 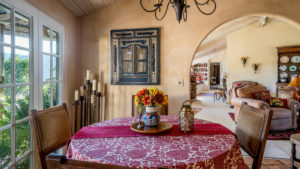 The owners extensive collection of native art is on display everywhere: from hammered silver platters to colorful woven textiles and hand-painted pottery. 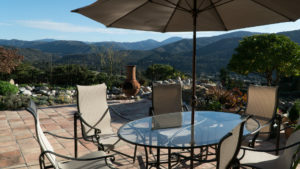 The home is designed around the patio and the view. 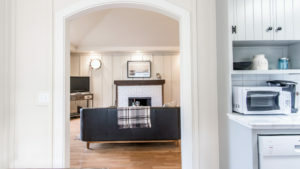 The main living room (with fireplace and large TV), a small office/library, a guest room, laundry room and powder room are opposite the kitchen, which features a ceramic cooktop, two ovens, a built-in microwave and a a butcher block island. 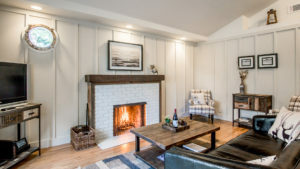 On the other side of the dining area, there’s a second small sitting room with a fireplace, a hallway with a long loveseat, and two additional guest rooms. 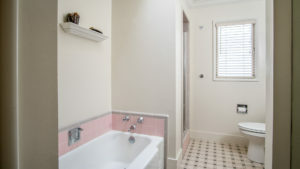 A bath with a stall shower is accessed via the hallway and guestroom two. 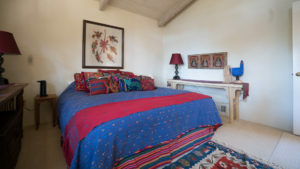 The valley view master suite has a King bed, a TV in the armoire, a massage chair, and a private bath with two lav sinks, a soaking tub, and a walk in shower. 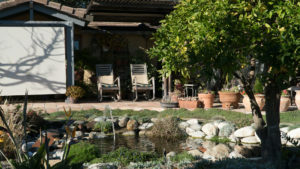 You’ll be spending considerable time outdoors, relaxing in a rocking chair, barbecuing, or dining al fresco. 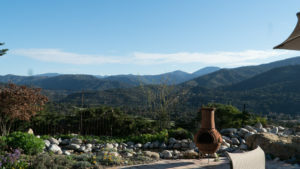 In the evening you can warm yourself by the wood-burning chiminea under a canopy of stars, absorbing the peace and contentment this area is noted for. 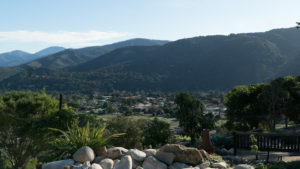 And when you’re ready to leave this idyllic retreat, you’re less than five minutes away from fine restaurants and a plethora of excellent wineries and tasting rooms. Carmel By The Sea Vacation Rental – Thistle Cottage! 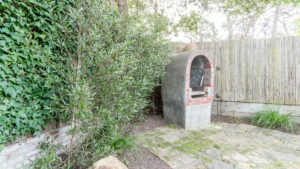 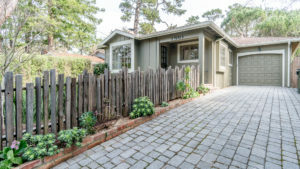 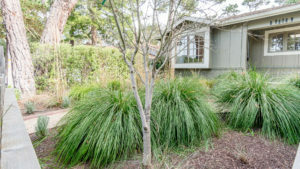 Situated in one of Carmel’s quietest neighborhoods, surrounded by majestic pine trees, this charming cottage is just five short blocks from the heart of Carmel (and a 20-minute walk to the beach). 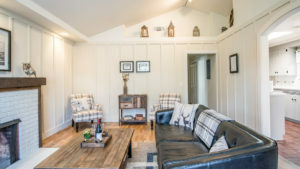 The country-style living room has a cozy wood-burning fireplace (with gas starter), HD TV, vaulted ceilings, a bay window, and lots of natural light. 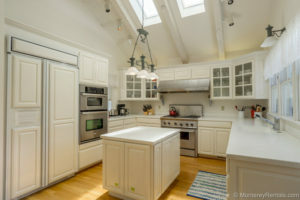 The bright, updated kitchen—with high ceilings and a skylight—includes a charming breakfast room surrounded by windows. 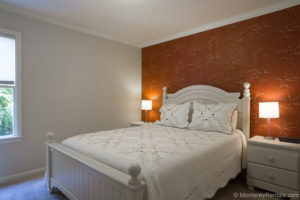 The Master bedroom has a king bed, a wall mount HD TV, a full bath, and French Doors accessing a private patio. 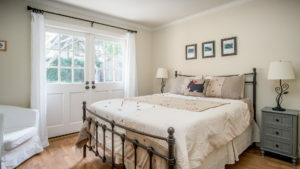 The second guest room has a queen bed with a full bath with a tub/shower, and French Doors that open to the inviting, sunny backyard. 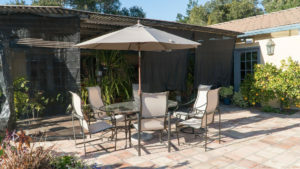 Enjoy fabulous indoor/outdoor living in your own private backyard with mature landscaping, a brick patio, an outdoor fireplace, and a detached cottage/artist studio with a desk for working, creating… or just daydreaming. 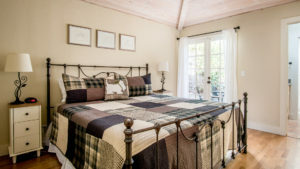 Decorated in soft neutrals and tartans, the cottage features wool rugs, reclaimed wood furniture, and hardwood floors. 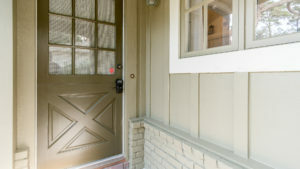 Handcrafted, whitewashed interior doors enhance the warm, custom feel, and original art-inspired by the natural beauty of Carmel-adds to the ambiance. 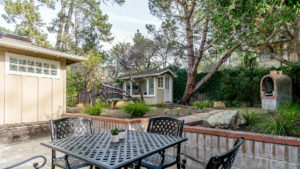 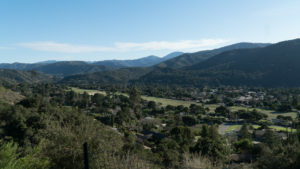 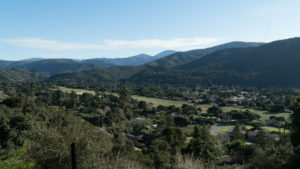 It’s a ten-minute walk to Carmel’s quaint shops, beautiful art galleries and excellent restaurants, and just a short drive to the Carmel Mission, Seventeen-Mile Drive, Pebble Beach golf courses and trails, Point Lobos State Natural Reserve, and the Barnyard and Crossroads shopping centers. 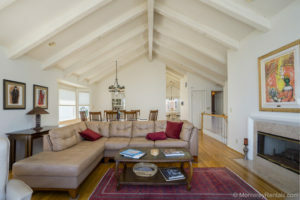 Pacific Grove Vacation Rental – Ain’t Life Grand? 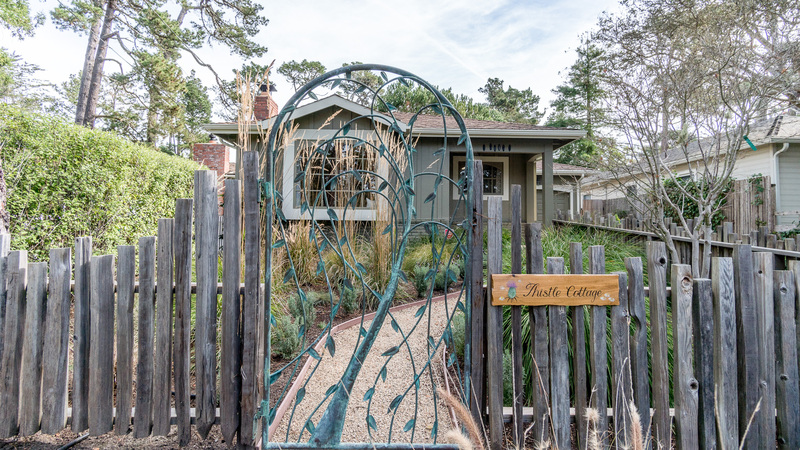 This urban oasis is just a few blocks from the beach, and around the corner from one of the most charming Main Streets in America. 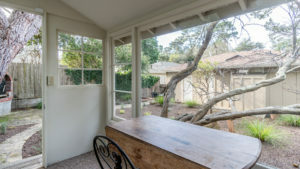 Located in the commercial district of Pacific Grove, it’s just steps from shops, galleries, restaurants, cafes, a wine bar and a movie theater. 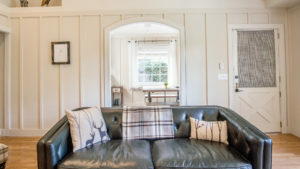 The entry area – with a bistro table and a sofa – is set up like a storefront. 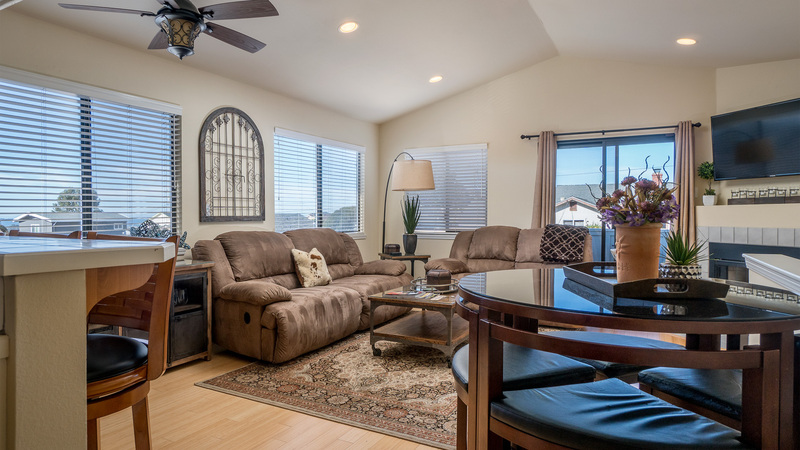 The real living areas are behind the door, where you can relax on leather sofas adjoining a lovely kitchen with mocha-colored quartz counter-tops, stainless appliances, and a breakfast bar that seats four. 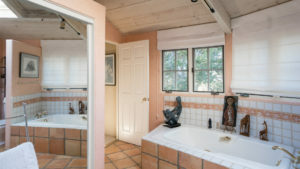 The master bedroom has a private bath with a walk-in shower; the upstairs bedroom has a peek of the ocean and an en suite powder room. 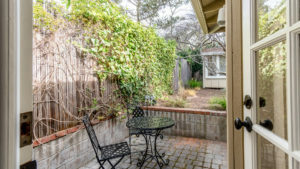 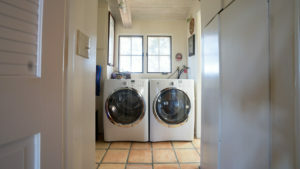 The laundry is in the basement at the bottom of the stairs, and all the delights of Pacific Grove are right outside your front door. 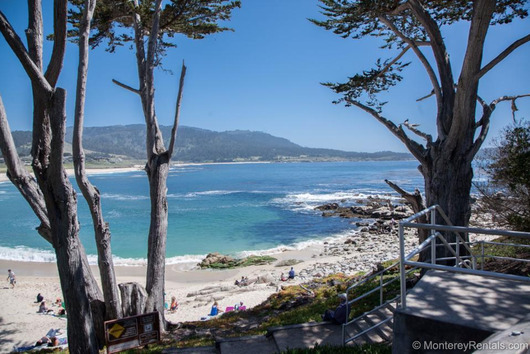 You can swim, dive or kayak at Lover’s Point right down the street (with a white sand beach for sunning, a kiddie pool, beach volleyball court, and a snack bar, café and restaurant). 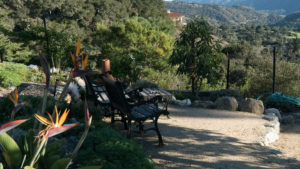 With grassy areas for picnics and surrey, bike, kayak and paddle board rentals—this park is a favorite of visitors and locals alike. 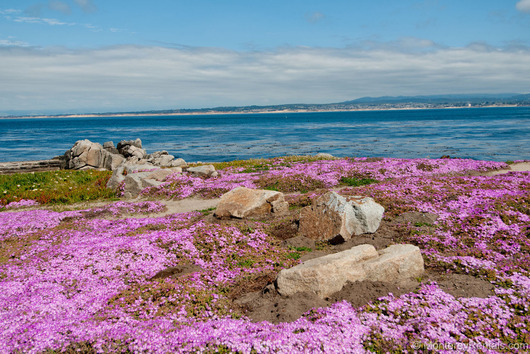 Stroll down the coastal recreation trail to commune with seals and sea otters, or play golf at the ocean side Pacific Grove Golf Course, affectionately known as a “budget-minded alternative” to Pebble Beach. 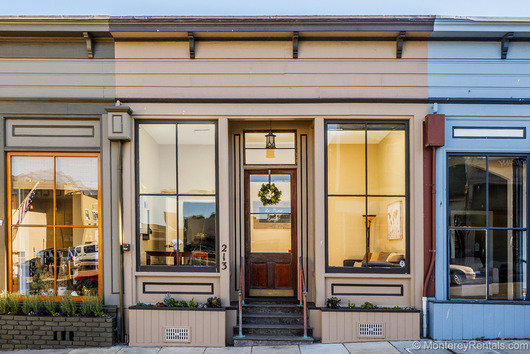 Street parking and one designated space in the lot across the street. 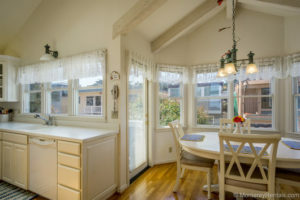 This 3-bedroom, 2-bath home in a residential area of upper Seaside is perfect for a longer stay. 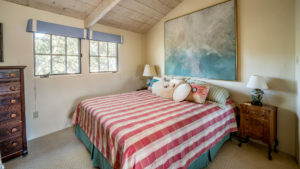 The main living areas – with panoramic ocean views – are on the upper level, along with the master bedroom and a full bath. 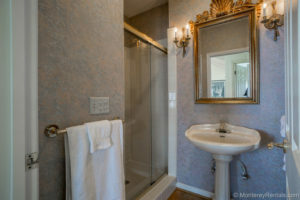 Downstairs, two guestrooms (one Queen and one twin trundle) share a second bath (also with a tub/shower). 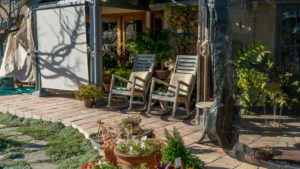 This home features multiple areas for enjoying the outdoors. 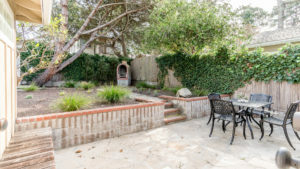 A small deck off the living room has a gas barbecue, and on sunny days the ocean view balcony off the master bedroom will be your favorite hangout… unless you’re in the yard, serving wine and cheese on oak wine barrels under a vine-covered arbor… or warming yourself around the fire pit (Duraflame logs only) after the sun goes down. 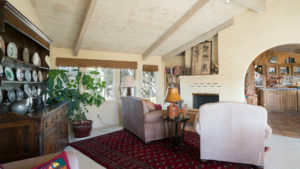 The living room has bamboo floors, a large TV, and a gas log fireplace. 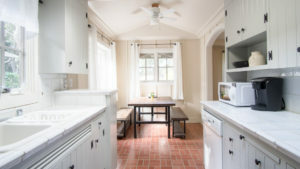 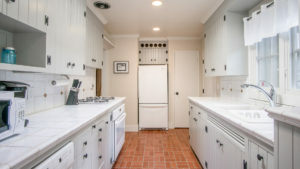 The kitchen has tile countertops, a gas range, a side-by-side refrigerator and a breakfast bar (there’s also a glass-topped dining table with seating for four). 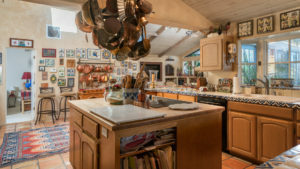 But in this location, cooking is optional: take your pick from fast food, delis, diners, and a gamut of international cuisines: Thai, Chinese, Mexican, Japanese, German, Italian, and more. 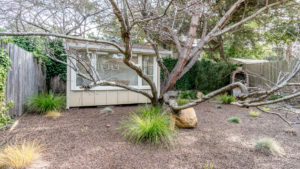 Single car garage. 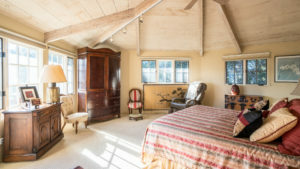 Sleeps 6 in beds: 2 Queens and one twin trundle (plus air mattress for extra guests). 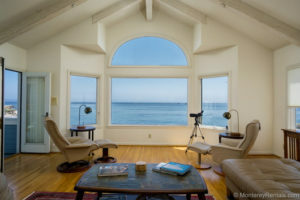 You won’t believe the view from this beach house: otters in the kelp beds, fishing trawlers, sailboats, and at night—the moon over Monterey Bay. You’ll be spending most of your time on the upstairs balcony or in the great room, with a comfortable leather sofa and chairs, a fireplace, and a telescope to check out the sea life. 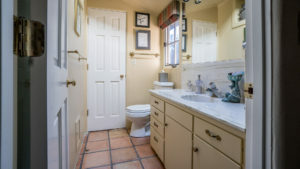 There’s a full bath with shower, a dining table for eight, a sunny kitchen with a professional gas range, and a breakfast nook that seats four. 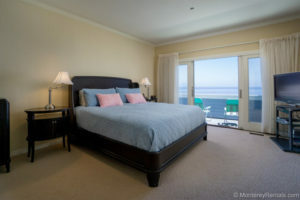 The master bedroom has a King bed, a large TV, and doors that open to the living room balcony. 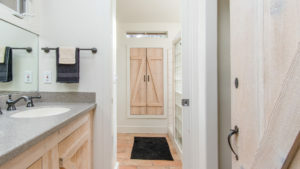 The en suite bath features a double vanity, soaking tub, walk-in shower and a large closet. 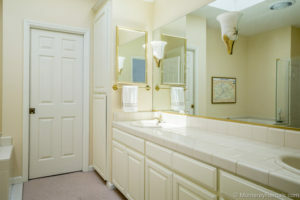 Downstairs, there’s an office area off the entry, a laundry room, a bath with a shower, a den with two sofas and a TV, and two additional guest rooms. 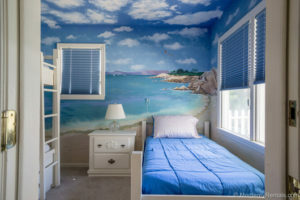 One has a Queen bed, the “blue room” has three twins (bunk beds and one separate twin) along with ocean-themed murals on the walls and ceilings. 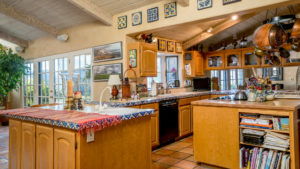 This home includes a two car garage, a central vac, and a portable propane barbecue (when you’re not enjoying one of Pacific Grove’s amazing restaurants). 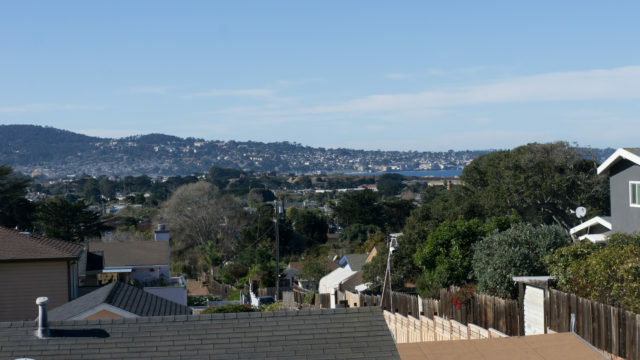 The coastal path is right across the street; Lover’s Point Beach is a five minute walk; Cannery Row and the Aquarium are just 1.5 miles away.